HomeGain inducts 18 new agent members into its elite commissions based award clubs for closing home sales; Half million dollar Diamond Club grows to 23 members. 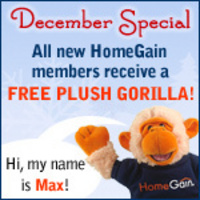 Realtors who sign up for a new HomeGain membership in December will receive a plush gorilla named Max! “We are pleased that we can quantify the continuing success of our members using AgentEvaluator,” stated Louis Cammarosano, General Manager at HomeGain. HomeGain®, the first web site to provide instant online home values, today announced it has inducted two new members to its Diamond Club for earning $500,000 or more in gross closed commissions from closed home sales using AgentEvaluator®. HomeGain announced the induction Therese Albertini, CEO of LifeStyleMOVES, and Carl Medford of Windermere Properties of the East Bay into its elite Diamond Club. AgentEvaluator® is an online marketing program for real estate agents who are looking to connect with home buyers and sellers. Learn more about how to become an AgentEvaluator member and how to receive a free plush gorilla with a new HomeGain membership this month.